Heat shrink owes its incredible capabilities to treatment with an electron beam from a particle accelerator. 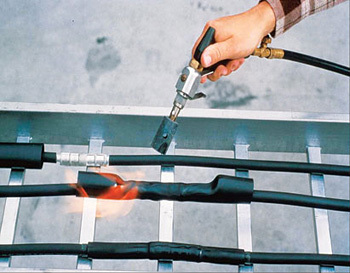 Intense heat shrinks the heavy-duty tubing over a power cable. Electron accelerators are used in producing the tubing. Photo courtesy of Tyco Electronics Corp. The Trans-Alaska Pipeline runs through 800 rugged miles of mountains, forests, and rivers. Wrapped around much of this sturdy pipe, a durable coating known as heat shrink has held the line against corrosion for more than 30 years. The same material protects the tangles of wires in the electronics we use every day. Heat shrink arrives from the factory in colorful, rubbery sheets or tubes. Wrap it or slide it around cables or wires, then wave a heat gun over it. Instead of melting, the polymer-based product shrinks to form a tight seal. Specific grades of this material are designed to prevent wear, resist burning, keep water out, and keep electricity in. "If you take normal polyethylene and melt it, it just turns into a gooey mess," says David Vroom, who retired four years ago as the engineering and technology manager at Tyco Electronics, the largest manufacturer of heat shrink in the United States. Treat polyethylene with a particle beam, however, and it becomes more resilient. Tyco Electronics Menlo Park, California, plant sends millions of feet of heat-shrink tubing each week to factories all over the United States. Inside the plant, vats of white pellets melt. Color is added, if desired, and the polymer flows through an extruder into cool water, where it solidifies into tubes. The tubing threads through an opening in a six-foot-thick wall and passes through the beam of a small electron accelerator. Peering through slanted, water-filled portholes, you see a blue shimmer over the tubing. Thats the electrons ripping air molecules apart. Inside the polymer, the radiation shears off hydrogen atoms, leaving the equivalent of sticky ends that bond together and make the polymer stronger. "It looks exactly the same as before, maybe a little darker," Vroom says. But the materials chemical structure has changed. Its molecules will remember their positions even after being stretched apart. To finish up, machinery heats the material, then quickly cools it while blowing it up with air like a balloon. The tubing "freezes" at up to four times its original diameter. Tyco Electronics produces a cornucopia of custom and standard tubes with different properties, colors, thicknesses, diameters, and lengths. Workers can easily slide the expanded tubing over cables that need protection or color-coding. When they heat the tubing again, it shrinks back to its original size. Heat shrink shields wires inside airplanes, buses, alarm clocks, and computers. It surrounds telephone cables and the ends of some shoelaces. "Theres heat-shrink tubing in your car. Theres heat-shrink tubing in your VCR," Vroom says. "Theres heat-shrink tubing everywhere."